Home / Blog / Panasonic makes you pretty? 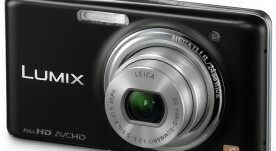 Have you heard about the new Panasonic Lumix FX77 camera that went out on the market in Japan last week? The camera claims to “improve the looks” of people. It can make your face smaller, whiten yellow teeth, make eyes bigger, remove dark circles, give you a chin lift and even apply makeup instantly! I am not sure I am convinced that it is the way to go for simple point and shoot cameras, especially if the users are taking pictures of a whole bunch of things and not using it solely for shooting close up portraits of people. But I won’t knock it ’til I have tried it. When I heard of this camera my first reaction was negative. I thought of the pressure millions of teenagers must feel to try to aspire to near perfect looks. Most importantly, what are we teaching the younger generations about beauty? Is Panasonic telling our kids that they need beauty enhancements and profiting from low self esteem? Is it real if you are faking it? The more I read about this camera, the more I like the idea of what you can do with the editing features. My Color Mode and the Art Retouch mode are definitely cool features to have. I'm still not sure about the “make my skin lighter”, “whiten my teeth”, “lift my cheeks”, “apply makeup” and “make me look thinner” modes. If I was looking for a point and shoot camera to carry around in my purse I might consider this one, but probably wouldn't use it to take portraits.